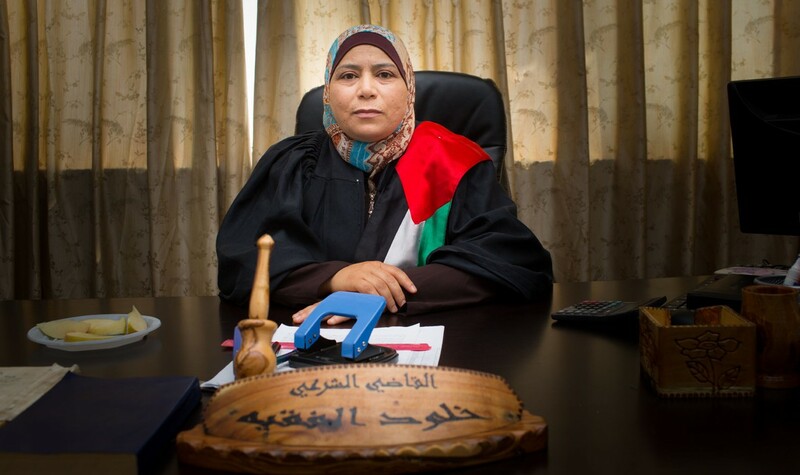 When young lawyer Kholoud Al-Faqih walked into the office of Palestine’s Chief Justice and announced she wanted to join the bench, he laughed at her. But just a few years later, Kholoud would prove him wrong. THE JUDGE provides rare insight into Shari’a law, an often misunderstood legal framework for Muslims, told through the courageous journey of the first female judge to be appointed to the Middle East’s religious courts. In the process, the film illuminates some of the universal conflicts in the domestic life of Palestine—custody of children, divorce, abuse—while offering an unvarnished look at life for women under Shari’a law. Erika Cohn is an American filmmaker who studied film production, Middle Eastern studies, and acting performance at the Chapman University of California and the Hebrew University in Jerusalem. She is the director of the short film When the Voices Fade (10), which received a Director's Guild of America Award, and the feature In Football We Trust (15). The Judge (17) is her latest film. "The documentary is an inspiration to women - not just in the Middle East - who are determined to rise to the top of their professions, despite the odds being stacked against them." "Director Erika Cohn pragmatically and fairly addresses every side of the issue with inspiring assurance and clarity." Despite controversy and threats, Muslim spiritual leader Ani Zonneveld takes a stand for justice through activism and a progressive practice of Islam. Enduring threats, excommunication from family, and opposition from many fellow Muslims, she insists that the Qur’an is a progressive text and believes in an egalitarian view of Islam.